Rhubarb Rhubarb Rhubarb is an indistinct chant or none sense word shouted out in an unsynchronised manner at a public event. ‘A rhubarb’ is baseball slang for a fight or argument among players. “Stop talking rhubarb”. Complete and utter balderdash and b*****s.
Stewed or in a pie it is the food of gods. Even raw with the stick end just dipped in a little sugar – gear nosh. Already his year I have had Rhubarb flavoured gin and a special cider flavoured as Rhubarb and custard. According to some ‘Its very name means “food of the barbarians” the people who live beyond the Rha, now the river Volga’. To some less fortunate Rhubarb is a strong purgative. It is one of the earliest crops in the garden. It can be forced into even earlier cropping if kept in the dark with a bit of warmth eg from a straw wrapper in an upturned bucket. The stems will then be thin, blanched pink and juicy. 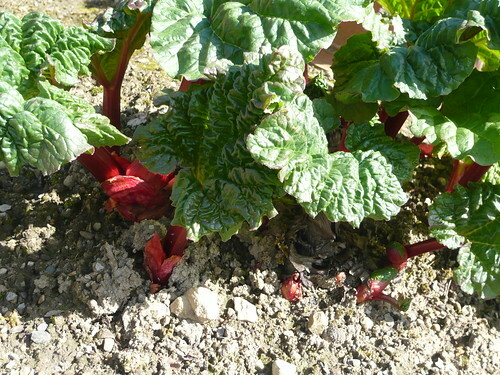 Rhubarb is hardy and if fed and watered will produce for many years. The big leaves are easy to compost. Even though they contain Oxalic acid they do no harm in the compost heap.